Behold & Reflect: Review of "The Life Giving Home: Creating a Place of Belonging & Becoming"
Review of "The Life Giving Home: Creating a Place of Belonging & Becoming"
I finished reading mother-daughter duo's The Life Giving Home some weeks ago, but I had to process the ideas and emotions it provoked before I could write up a review. You must know by now, if you read me, that I spend waaaay more time thinking (daydreaming) than I do housekeeping. Likewise, as a capital "I" introvert, the vast majority of conversations that occur in my house also occur in my head, with myself. So, hospitality and remembering to ask you if you'd like a hot drink are not my specialty. But, how I wish I was that person. 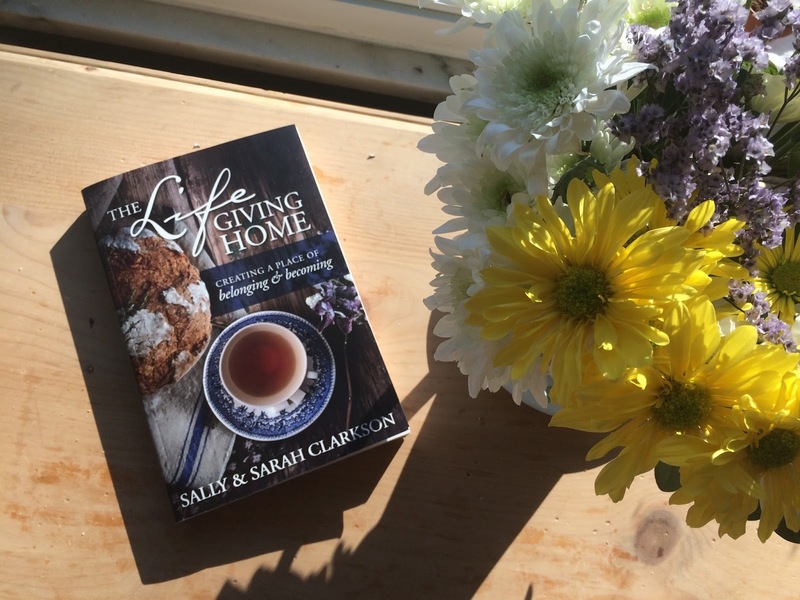 How I wish I was an honorary member of Sally and Sarah Clarkson's idyllic family, with their tea time and their family dramas (I'm not talking reality TV drama, I'm talking Little Women "let's put a play on in our study to brighten this dreary winter" drama). How I long to be a better homemaker and how easily I embrace the idea that you can be a feminist and a wonderful host(ess) at the same time. Just look at that subtitle: "Creating a place of belonging & becoming." How glorious that sounds! I could do it without the tea time sugar cubes and fancy china... but who doesn't want to have a place where they feel unreservedly loved and supported as they discover who they are becoming? Who wouldn't want to make their home such a place? The wise and loving mama, Sally drew me in by the emotions. She seems to have a gift for filling her house with people and love, and I pray I could boast that my boys consider home their favorite place on earth even after they've moved out. My brainy side was particularly intrigued by Sarah's exploration of the theology of home, rootedness and beauty in light of the incarnation (chapter 4). The Clarksons are both down-homey and high-brow. They love literature and fine art and Celtic music and hikes in the Colorado Rockies which, apparently, are just off their backyard in God's Country. They watch all the PBS period dramas I do and keep fresh flowers and bake bread from scratch. As homeschoolers, they took spontaneous road trips to enrich history lessons, and made character lessons a centerpiece of curriculum. As avid readers, each member of the family had his or her own reading and creating nook. If these ideas pique your interest (as they do mine), there's a whole lot more where that came from. However, if your family is more into, say, current events or sports or technology or ninjas, or the fourth dimension (I am the sole female in my family of five) then the Clarkson Way might not resonate with you as much. Though the particulars might not fit every family, the book is valuable because it presents a broader picture of a family that very intentionally established what they felt were the most important principles, goals and leisure activities into the daily structure of their home life. And because of the sheer number of ideas for family and hospitality-centered events, rituals and traditions contained in Life-Giving Home, I think most readers would be able to benefit from picking out even one or two ideas and making them their own. My reality is children on whose radars are none of my lofty, literary hopes for a Clarkson style life giving home. But the book empowers me to embrace and codify some of the things that make up the Parrino-style life giving home. For us, we share a love of books, nature, geography. So we read beyond our bedtime most nights. We talk about habitats and bird watch out the kitchen window. We have a map of the world on our dining room wall, which we discuss at most meals. And, our newest tradition, urged on for the umpteenth time by this book, is one that most people probably already do: We finally eat the same dinner together at the same table at the same time. This might not sound like much to you normal people out there, but for me it's HUGE. It's a gateway to more intimacy, belonging and becoming.